For many years, wideangle lenses embraced a view about twice as wide as the human eye can encompass. The lower the numerical designation of a lens, the wider it becomes. The so-called “normal” lens, which sees as the eye sees, is called a “50mm lens.” Thus standard wideangle focal lengths become 28mm and 24mm. However, the last few years have seen a revolution in camera optics, with the advent of wideangle zoom lenses that can embrace up to four times as much content as the human eye can see at one time. These lenses, which may offer such focal lengths as 14mm, 16mm, 18mm, and 20mm, are called super wideangle zooms. I recently added such a lens to my Panasonic G1 system, and began extensively using it for the first time in the field on a trip through the Pacific Northwest. I quickly saw that such lenses require greater thought and skill than any other lens I’ve used to date. There is a learning curve, and it takes time and practice to grasp it. The most important factor in expressive wideangle photography is selectivity. We must be able to isolate the subject, simplify it through abstraction, and relate it to only essential context. It is very difficult to make a super wideangle lens see selectively. 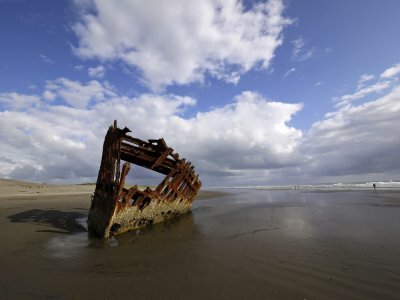 Its frame encompasses so much, such as empty skies, cluttered foregrounds or backgrounds. It also keeps everything in sharp focus, which encourages random mergers and chaotic images. To avoid such problems, we are forced to move very close to our subject, yet when we come that close with such a super wideangle lens, it is easy to create unwanted distortion. To combat such distortion, we must hold a super wideangle lens at right angles to the subject. The slightest tilt can make our images look like a scene from a fun-house mirror. On the other hand, there are times when such deliberate wideangle distortion can offer a powerful tool for expression. I present this gallery, as usual, in "blog" style. A large thumbnail is displayed for each image, along with a caption explaining how I intended to express my ideas. If you click on the large thumbnail, you can see it in its full size, as well as leave comments and read the comments of others. I hope you will be able to participate in the dialogue. I welcome your comments, suggestions, ideas, and questions, and will be delighted to respond. My 14mm superwideangle focal length distorts the façade of the church, making it bend inwards and thrust upwards, which stresses the implied power and influence of religious institutions on this historic city over the centuries. The distortion also makes the clouds seem to explode out of the church, a reference to its spiritual presence here. The early morning light causes deep shadows, which add a touch of mystery, as well. We stopped to photograph a famous peak marking the outskirts of Monument Valley. When I walked over to the fence, I saw that the story here rests not only in the peak itself, but even more so in the context supporting it. Using a 18mm super wideangle focal length, I compare the powerlines flying diagonally across the sky to a barbed wire fence that sweeps diagonally across the ground. 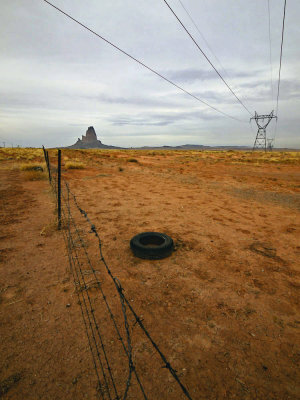 The fence leads to Agathia Peak, by way of an abandoned tire. The image says more about the nature of life on the Navajo reservation than it does about the famous Agathia Peak. Half of Kiev’s population was killed during the Second World War. The three-year Nazi occupation was brutal. The Red Army liberated the city at the end of 1943. Today this tragic period is recalled in a park just south of downtown Kiev, along the Dnieper River. The Soviet Union has vanished and the Ukraine is now an independent nation. A heroic statue erected by Soviet chairman Leonid Brezhnev honors what was then Ukraine’s “Motherland,” the USSR. Before it stands a cauldron meant to hold an eternal flame in honor of those who perished. 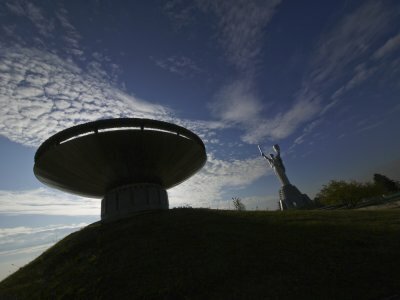 I used a superwide angle 14mm focal length here to relate the cauldron to both the statue and the overhead clouds. I positioned the largest flow of clouds to symbolize smoke over the cauldron at left, and turn the dagger of the statue into a torch held just below a smaller flow of clouds at right. Since I am much closer to the cauldron then the statue, it dominates the scene, anchoring the image upon a funereal black mound and bowl. The slight tilt of the statue adds a surrealistic edge to the photograph. A superwideangle focal length of 14mm allows me to stand very close to these slabs in order to stress the detail upon and the delicate play of the sunset on the stone. Yet the slabs are quite large in scale, and only a superwideangle perspective can allow us to move in tightly yet still include the surrounding trees and distant green grass for context. The extreme wideangle lens also has tremendous depth of focus – everything remains sharp, from just below the lens all the way to the horizon. The tombs hold the bodies of those who once lived in this massive 17th century castle. 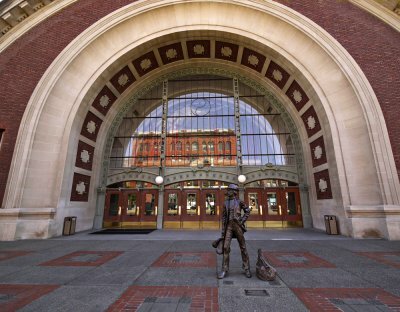 I wanted to build this image around the enormous arch over the doors to this former station, as well as the reflection of Old Tacoma in its huge window. With any other lens, I would have to back up in order to fit the arch into my frame. However, the super widengle lens at 16mm allows me to move in on that arch and fill the frame with it. The closer I get to it, the simpler the image becomes, and the more visible the detail becomes for context. Among that detail is a life-sized statue of a 19th century traveler. It is only a few feet from my lens, yet appears quite small in comparison to the large arch. This image demonstrates scale relationships achievable only with super wideangle optics. This is an example of how a super wideangle lens can help us interpret subject matter in very tight quarters. This bunker was very small in size. 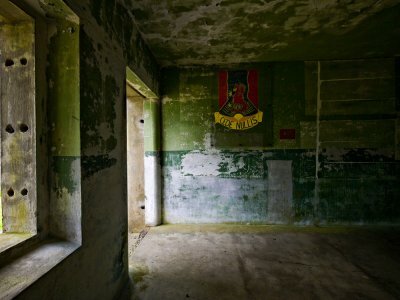 I wanted to include the light coming in from both the doorway and the window and also embrace the sixty five year old regimental badge on the wall. I backed up as far as I could go and was able to make include all of this at 14mm. The image shows no distortion because I held the lens at right angles to the walls. If I had tilted it up or down, the wall at the side would have leaned in to the frame. This image takes us back to another time – these are the colors of World War II. 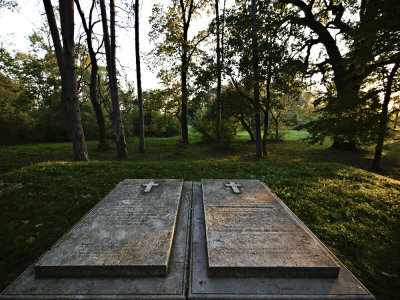 They may now be worn and weathered, but they still offer a haunting reminder of that conflict. This vintage Oldsmobile Rocket 88, restored by a passionate mechanic in the tiny town of Miranda, on the Avenue of the Giants in California’s Redwood Country, was being offered for $3,800 the day I visited. I saw an entire era embodied in this old car, an era of where cars were designed and marketed as if they traveled as fast as rocket ships. 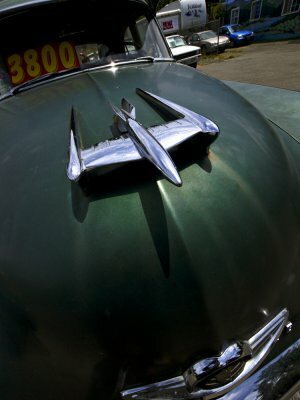 I moved in on the famous hood ornament of the Rocket 88 with a 14mm super wideangle lens, bringing the glass to within a few inches of the thrusting chrome rocket. Yet the huge vertical field of view embraced by this wide a focal length allowed me to include an area from the grille badge at the bottom of the frame to the sale sign in the window as well as three other cars parked on this lot at the top of the frame. 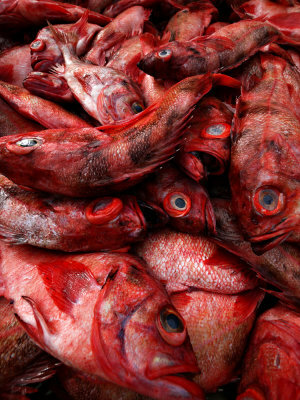 Once again, I move in very closely with a 14mm super wideangle lens, this time making a grotesque portrait of a pile of red snapper being unloaded from the freezers of a fishing trawler in Fort Bragg’s harbor. The slight tilt of the lens allows me to deliberately distort the size of the heads closest to the lens at the bottom of the frame. The unseeing eyes bulging from the fiery red bodies are enormous, offering us a vision of hell itself. The focal point of the image, however, is the expression on the head partly obscured by a tail. The eye is glazed over, and the gaping mouth seems to scream at us. The ultimate incongruity: as hellish as this scene may seem, these fish have been harvested to bring profits to an industry, and pleasure to those who delight in eating red snapper. 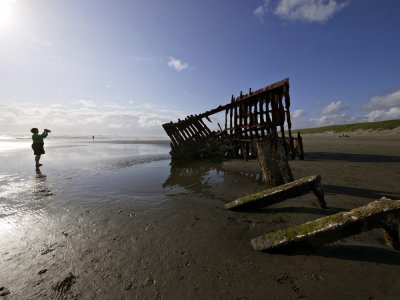 This is the first in a series of three super wideangle images featuring the wreckage of a commercial ship that ran aground on Columbia Beach one hundred and three years ago. 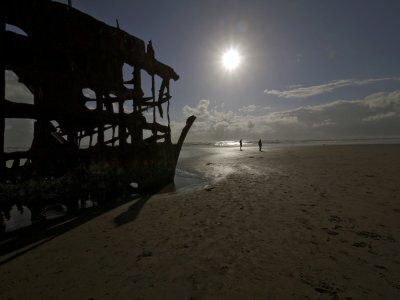 In this image, I create a relationship in space between the skeleton of the ship’s bow, the clouds exploding out of it, and a distant jogger who runs along the surf. The bow, exposed by the low tide, is only a few feet away, yet the 14mm focal length of my lens pushes it away as it if were yards, rather than feet, away. The runner is not that far from the lens either, but appears very small because of the 14mm optic’s way of interpreting distance. A sky full of clouds makes the image work. If the sky was empty, the image would lack the energy to express its ideas. To make this image, I moved behind the wreck, and used two remnants of its hull to lead the eye through the frame to the wreckage. The closest piece of hull is only a few feet from my lens. I backlight a tourist who walked into my frame and began making pictures. In this case, the abstracted figure and the glow on the wet sand energize the picture, negating the need for explosive clouds in the sky. She seems to be at peace as she explores the past with her camera. All four expressive elements in this image stood within a few feet of each other, yet the 14mm lens spreads them out. The degree of abstraction caused by the backlighting here makes this image work as expression. This is my most abstract super wideangle view of the wreckage. I made it at a 14mm focal length, shooting directly into the sun. I was only a few feet from the wreckage. I found a position where the old bow points to the sun, and waited for the two figures, which were not that far away, to enter my frame. Their silhouettes offer scale incongruity and further abstraction. 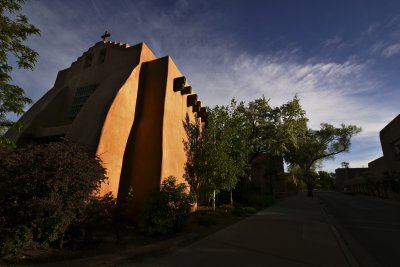 The image is well underexposed, turning a bright day into an evening shot. I expected to get distracting reflections of the sun’s flare in my lens, but found them minimal. The lens did, however, ring the sun with a mild starburst effect, which enhances the message. The distant figures seem to be eyeing the glowing wet sand for hidden treasures. 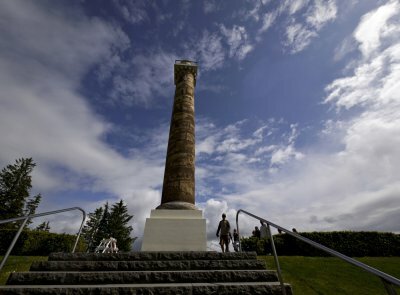 Soaring 125 feet into the sky, the Astoria Column was built in 1926 to commemorate the triumphs, conflicts, and turning points of America’s northwestern frontier. The sky provides much of the drama here, and the 14mm superwideangle lens extends the thrusting clouds perfectly. I moved close enough to the huge column to portray the intricate historical illustrations on its surface, yet I can still fit all 126 feet of the column into my horizontal frame. I could have even moved even closer by using a vertical format, but then I would have lost the sweep of the clouds behind the column. The final element of expression here is the tourists. I waited for the first silhouette in this group of six to reach the area between the column and the railing, and made this shot as he turned to go down the steps in front of me. The 14mm super wideangle lens makes him look as if he is thirty feet away from my camera, but he is actually only about five or six yards away. Thanks, Celia, for discussing the challenges of superwideangle photography. Your lens, when attached to a camera with a 1.5x magnification factor, would give you the equivalent of a 15mm-33mm range. The lens that I am using here, a 7-14mm lens on a camera with a 2x magnification factor, gives me the equivalent of a 14-28mm range, about the same as yours. We both must struggle with clutter at the wide end. It is difficult to make everything in a superwideangle frame count as meaning. I find this problem is easiest overcome by moving in with it, embracing less, distorting more, and creating greater emphasis, just as I did in the image you mention--"Nostalgia for sale<" as well as the "Red Snapper" image that follows it. I look forward to adding many more superwideangle examples to this gallery. This is a wonderful addition to your growing list of tutorials! I myself love wide-angle photography, frequently using a 10-22mm lens on my DSLR. Wide-angle comes quite easily to me- I don't know why-and I find it great for both landscape and street photography. It generally poses a challenge to many because of the amount of detail it tends to capture, often distracting the viewer from the main subject. In my experience I always find it useful to remember to have an anchor in my image and/or have an element that draws your eye through the image. Many people also have an issue with distortion that comes with doing superwide-angle photography, but I find that it can be a wonderful tool in expressing certain ideas. For example I love the exaggerated perspective of the chrome rocket ornament on the hood of the car in "Nostalgia for sale" that you made. The distortion thrusts the rocket so far forward that it looks like it could fly! I definitely am looking forward to seeing more images in this gallery! Thanks, Patricia, for sharing your thoughts on wideangle photography with us. I think it is wonderful self-discipline to use just one lens and learn to use it well. It can become a very special way of expressing yourself. Your 17mm focal length most likely translates to 26mm in 35mm terms on a Canon 40D, which is a standard wideangle focal length, and not as prone to distortion as a superwide angle lens such as my own, which is equivalent to 14mm at its widest focal length. Looking at your work, I think your own lens, which takes you from 26mm to 75mm in 35mm terms, seems to translate your vision perfectly. Hi Phil, I find this gallery quite interesting as the only lens I've used since buying my Canon 40D in October 2007 is a 17-50mm f/2.8. It suits me to a T. In my Falling Into Place project I most often used it at the 17mm setting. I guess I like to get right on top of my subjects, which is easy when you're doing self portraits. Yes, distortion can be a problem but as you so wisely pointed out, sometimes that is exactly what you want, and if not, there are certainly ways to avoid it. After using one lens exclusively for such a long time I've gotten to know her eccentricities pretty well, rather like I know those of my dear husband. For me, familiarity breeds not contempt but greater appreciation! You are right, Alina -- the super wideangle lens can indeed thrust the viewer deeply into the scene, and the depth of field is fantastic. This particular lens is extremely sharp, and has provides excellent contrast. The new wide angle lens is fantastic. Your photos Phil invite us to go into the scenery. I like its vivid color and sharpness that goes from foreground to background. Thanks, Iris, for your encouragement. You are right -- super wideangle photography is indeed a challenging matter, but as you note, the rewards are certainly worth taking the time to learn how to master the learning curve. It's interesting reading about the challenges of super wideangle photography, but your striking images have certainly whet my appetite for challenge!! If used correctly, as shown in these images, it certainly adds dimension and creativity to expressive photography. Bravo on your new gallery. Enjoyed viewing the photos in this gallery. Have a wide angle 12-24 and gave me creative ideas for my next shoot with that lens. Thanks Mo and Rusty. I have three lenses made for the G1. The kit lens I had to buy with the camera (and rarely use) is 28-90mm equivalent, and I added a 90-400mm telephoto zoom (equivalent). My newest lens is this 14-28mm equivalent super wideangle zoom. Thanks for your observation, Rusty -- it is a remarkable optic, yet as you say, it is not the lens or the camera that makes the picture. It is the photographer. I really like that new lens and the way it can be used for emphasis, geometry, shapes, angles, distortion. but of course it's not the lens any more than the camera that is doing these things.